So here's a little something I've made for Knit & Stitch it 2016, and to road-test my new consignment of bamboo yarn. I should stress, for the benefit of friends and family, who might be reading this that Emi's not about to have a little sister. 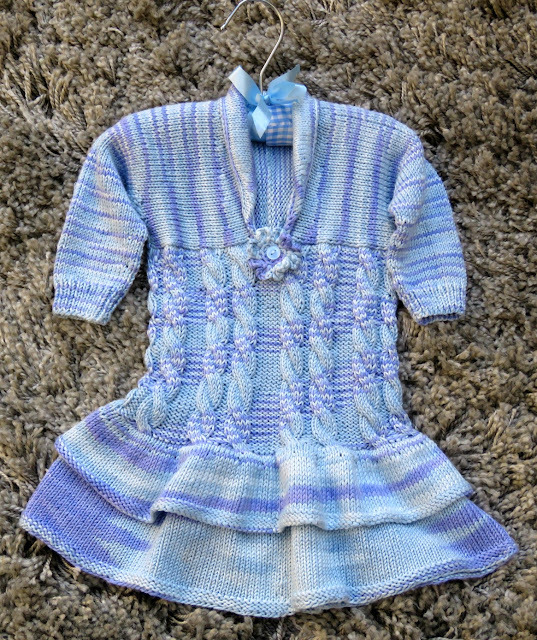 No, this project was an experiment, a fun experiment to create a dream dress for a lovely new baby girl. It should fit a little person of about 6 months to a year old. It measures 24 cm across the chest from armpit to armpit, and 41 cm in length from the shoulder down to the bottom edge of the bottom frill on the skirt. Then you leave the top to one side without casting off and cast on the skirt. This is knit in two frills with the first frill being knit up from the bottom. This first frill is knit in the round and shaped at the top so that it has the same number of live stitches as the bottom edge of the bolero-cable body. The two are then joined using three-needle bind off i.e. 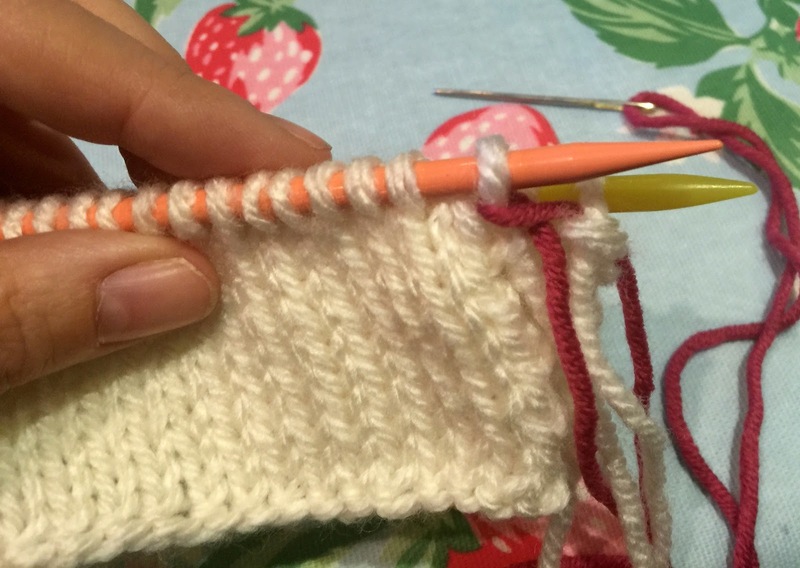 by knitting a stitch from the top needle with a stitch from the bottom (wrong sides facing). Then you carry on with the single complement of stitches to knit the second frill of the skirt, working it from the top down. And when you've finished you pick up the stitches around the neck to work a shawl collar, which you can then perfect with a little corsage embellishment at the bottom of the neck. 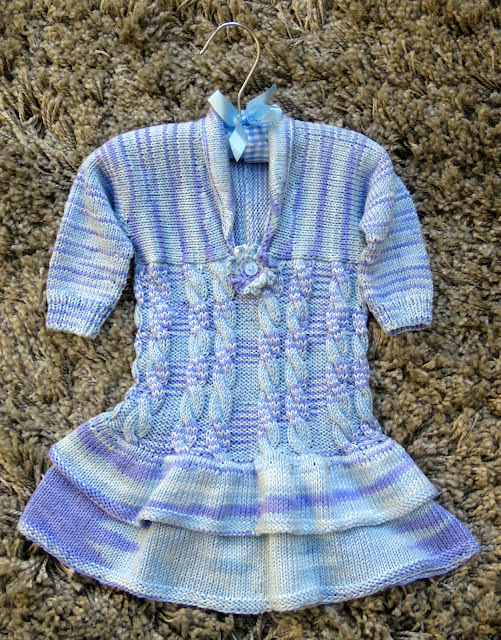 The yarn I've used is my own-label, Costa Brava Knitting, variegated bamboo in Lavender and Blue. This normally knits up on 3.75 mm needles but I took the needle size down to 3.25 mm/ US size 3 needles to get a more tightly woven texture. 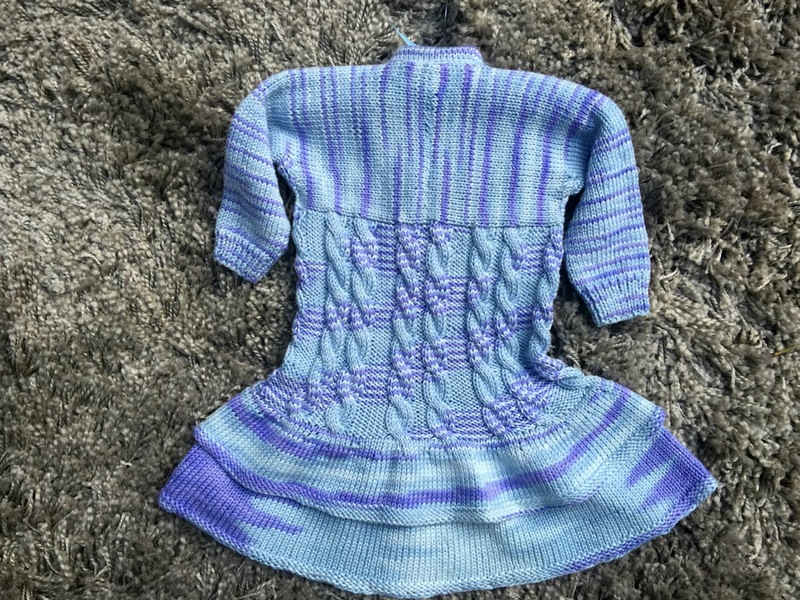 It's a dreamy yarn to use for a project like this, silky and smooth with a great drape for a nice swishy skirt - but you could use any other double knitting yarn that caught your eye and knit up to the same tension. This one knits up on the 3.25 mm needles with a tension of 24 stitches x 36 rows for a 10 cm² square in stocking stitch. 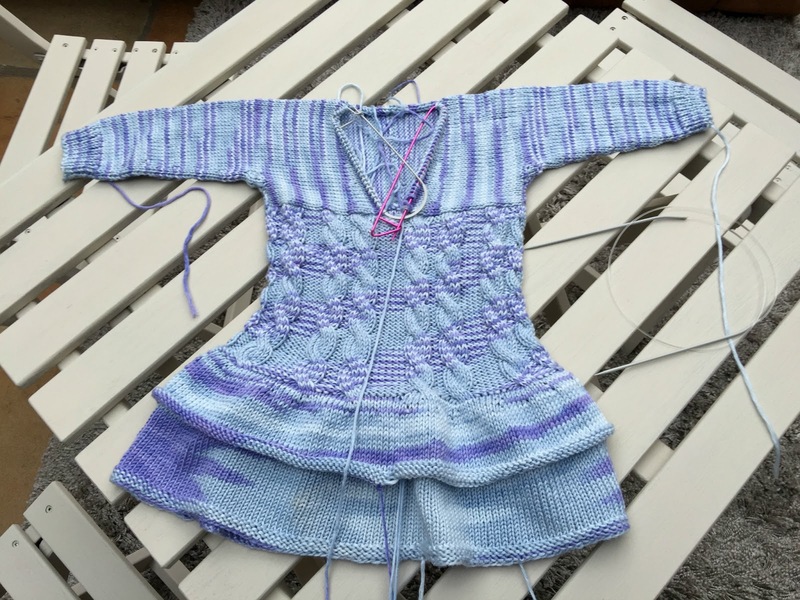 The dress will take between 5 and 6 50 g/ 100 metre balls of yarn. Just a word before we get started. This whole business of rights and lefts when you're knitting can be really confusing. 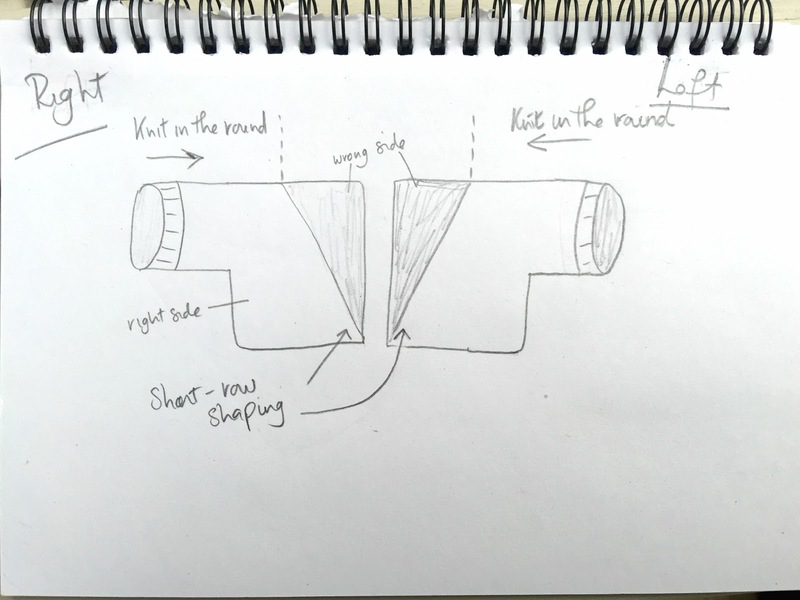 So, just so you know where I'm coming from, when I say that this is the right sleeve that means that it would be the right sleeve (as per the doodle-diagram above) if you were wearing the jumper, lying on your back and looking up out of the diagram. Okay? Cast on 36 stitches on 3mm double pointed needles. 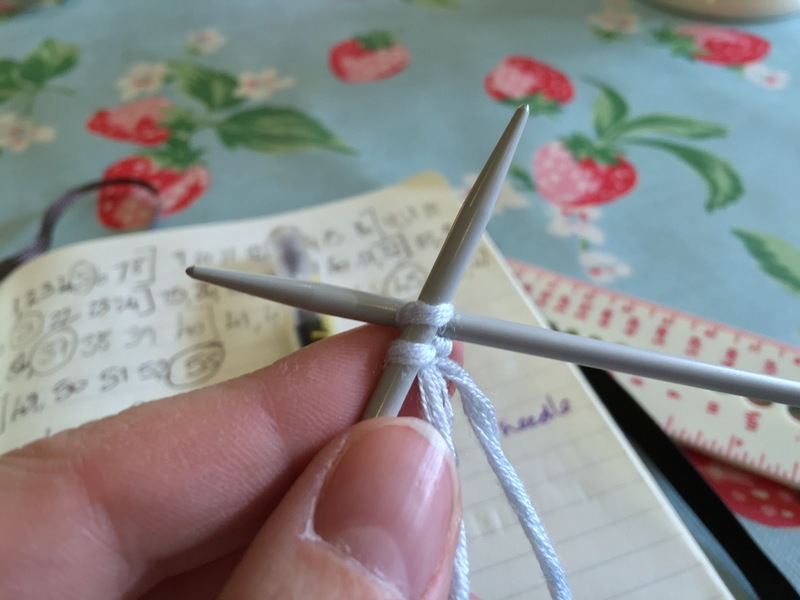 Join without twisting your knitting, and mark the beginning of the row with a stitch marker. Work 8 rows (Rows 1 to 8) in Knit 1, Purl 1 rib. 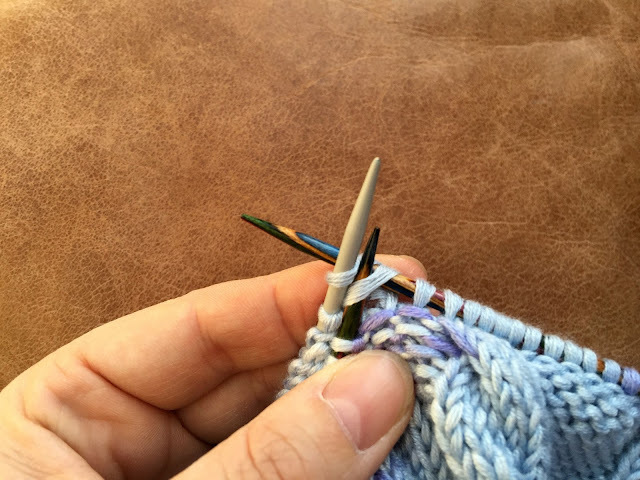 Change to 3.25 mm needles, or use circular needles and work the magic loop technique. Rows 9 to 16: knit. Row 17: knit 1, knit 1 into the front and back of the next stitch kfb, knit to the last 2 stitches, kfb, knit 1. By the end of this row you will have increased your total stitch count by 2 to 38 stitches. Rows 18 to 23: knit. Rows 24 to 30 knit. Rows 32 to 37 knit. Rows 39 to 44 knit. Rows 46 to 52 knit. N.B. row 54 is the last row that is knit in the round. 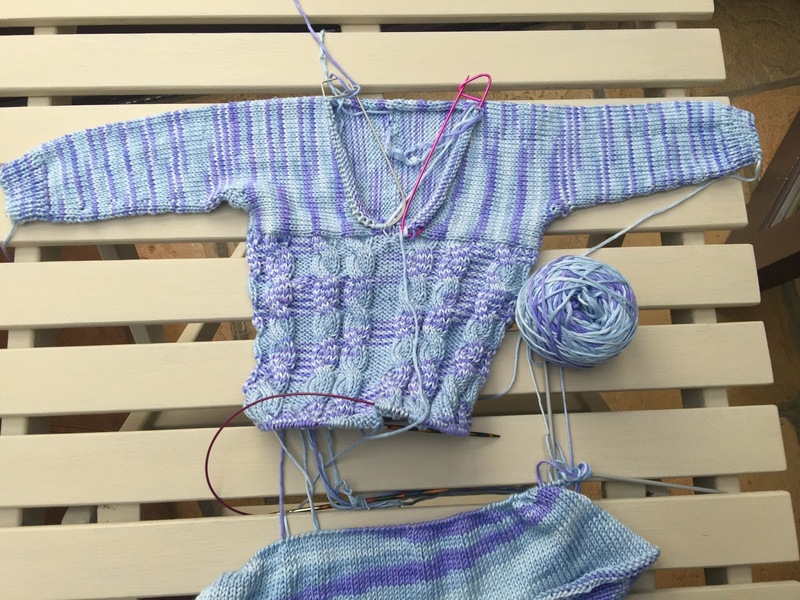 From here on the pattern is knit on the flat, knitting one way and purling back the other. Row 55: Knit 4, wrap the yarn around the fifth stitch and place it back on the right-hand needle "W". Turn. Row 56: Purl 8. W. Turn. Row 57: knit 6. W. Turn. Row 58: Purl 4. W. Turn. Row 59: knit 2. W. Turn. Row 60: Using the cable cast-on method, cast on 6 stitches purl-wise and purl to the end of the row (56 stitches). 1. Knit into the first stitch on the left needle, and pull the loop through without slipping that stitch of the needle. 2. 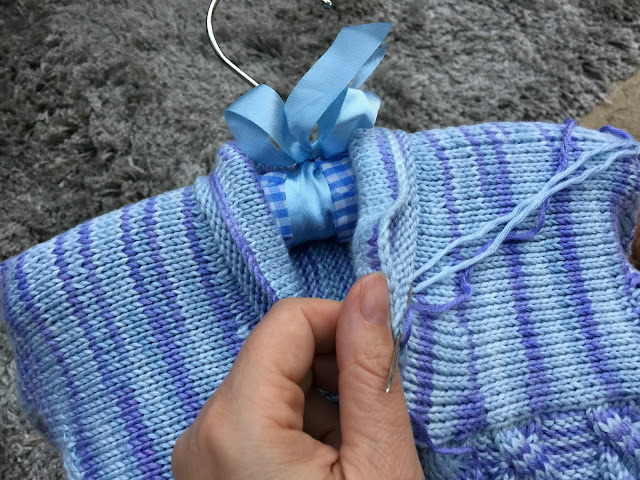 Pull the loop through, and slip it onto the front of the pre-existing stitch on the left needle without slipping that stitch off the left needle. Rows 62 to 86: work in stocking stitch i.e. knit the odd rows, and purl the even ones. Row 1: Knit 4. W. Turn. Row 3: Knit 9, W. Turn. Row 5: Knit 14. W. Turn. Row 7: Knit 19. W. Turn. Row 9. Knit 24. W. Turn. Row 11: Knit 29. W. Turn. Row 13: Knit 31. Then place the 31 stitches, thus knit onto a stitch holder, and knit to the end of the row. These 31 stitches on the stitch holder are the edge of your front V section. You're going to pick them up later to work the neck rib. A word by way of further explanation: our job here is to work the back so that it's the same width as the long bottom point of the short row V at the front. 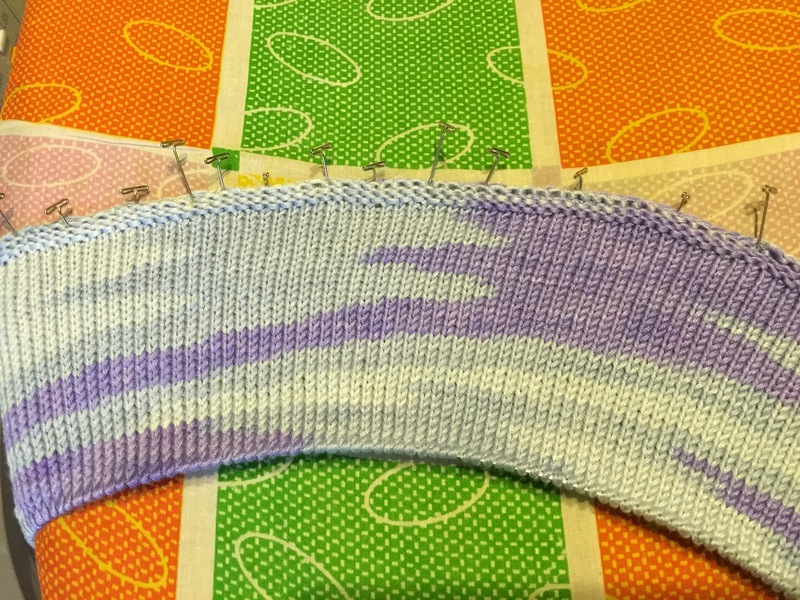 You just work in stocking stitch until the back covers the distance to the bottom point of the V on the front - this has extended out as a result of the short-row shaping. In the diagram above, you're now working this back section from the dotted line, where it stopped being knit in the round to the middle back seam where it will join with the other side. 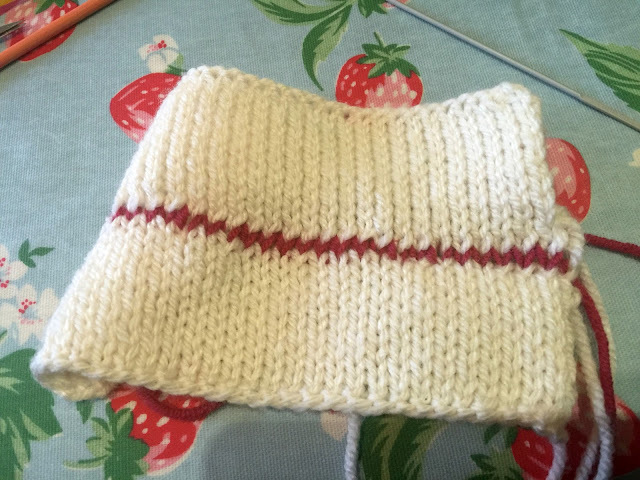 You need to knit it so that it measures the same distance from the needle as the bottom tip of the front V section. On my work this meant that my back section had to measure a total of 12 cm from the 6-stitch cable cast on of the armhole, which I covered with another 11 rows of stocking stitch. Rows 62 to 85: work in stocking stitch, ending with a knit row. Row 1: Purl 4. W. Turn. Row 3: Purl 9, W. Turn. Row 5: Purl 14. W. Turn. Row 7: Purl 19. W. Turn. Row 9. Purl 24. W. Turn. Row 11: Purl 29. W. Turn. Row 13: Purl 31. Then place the 31 stitches, thus worked onto a stitch holder, and Purl to the end of the row. Work the back in the same way as you did for the right side. To work a Kitchener Seam, hold the two live sets of stitches together, wrong side to wrong side. I've taken some photos working a sample with a contrasting yarn to show how it's done. 1. Line up the two sets of live stitches parallel to one another with wrong side of one facing the wrong side of the other. 2. 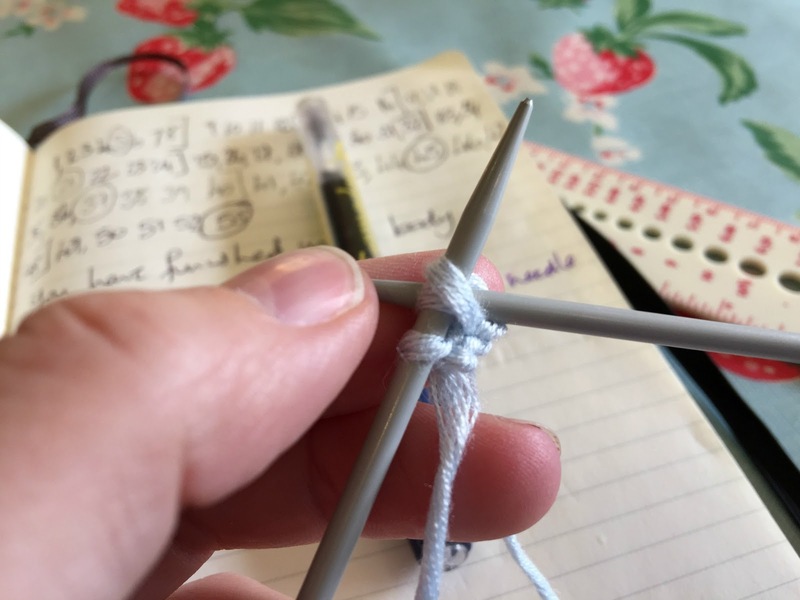 Thread a darning needle with the grafting yarn and insert it purl-wise into the first stitch on the front needle, and without pulling that stitch off the needle insert the yarn knit-wise into the first stitch on the back needle. Do not slip the first stitch on the back needle off. 3. Insert the needle knit-wise into the first stitch on the front needle, and slip it off the needle. 4. Then insert the needle purl-wise into the second stitch on the front needle but do not slip it off the needle. 5. Insert the needle purl-wise into the first stitch on the back needle and slip it off the needle. 6. Insert the needle knit-wise into the next stitch on the back needle, but do not slip it off the needle. 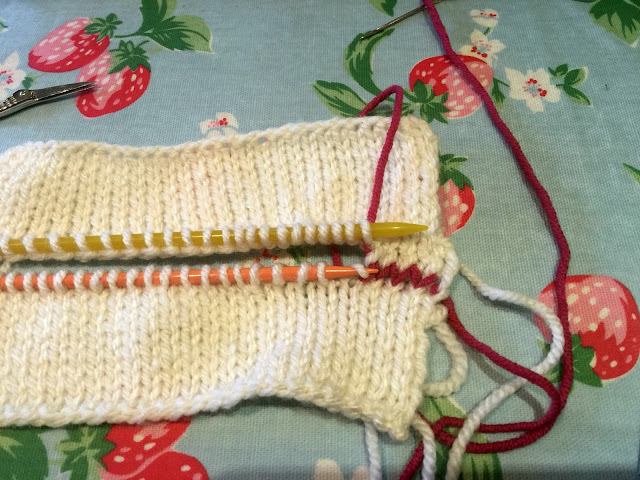 Carry on repeating steps 3 to 6 until all the stitches have been grafted together. Then fasten and darn in the loose ends. Having joined the back, sew up the underarm seams. With the right side facing, pick up 147 stitches evenly around the bottom edge of the bolero to knit the main body of the dress. I divided these so that I had 36 across each of the front sections, and 75 across the back. Join to make a circle, mark the beginning of the row with a stitch marker and knit in double cable pattern around the circle of the body, following the table below sequentially all the way around. The double cable repeats over 21 stitches. You will, therefore, have 7 double cable panels going around the body of the dress. C= cable front i.e. place first 3 stitches on cable needle and hold at the front of the work, knit second three stitches from left hand needle, and then knit first 3 from cable needle to produce a front twist. I've tried to produce a more conventional graph showing the stitch patterns for this 21 cable twist. Please check out my efforts below. I hope they help those of you who prefer to read the information in a graph format. 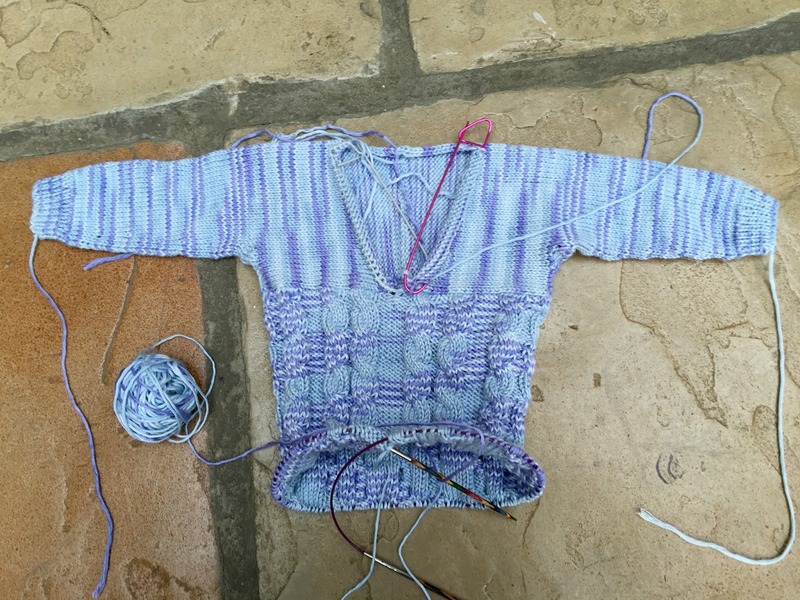 Carry on knitting until the cabled part of the body measures 17.5 cm, finishing with a cable row. On my knitting I knit 53 rows of cable pattern to reach that point. Now leave the body to one side, and get going on the skirt. Cast on 198 stitches using another pair of 3.25 mm needles. Join without getting any twists in the knitting, mark the beginning of the row with a stitch marker and purl the first three rows. Row 4 and all further rows are knit. Keep going until this bottom frill measures 10.5 cm. Row 1: * K1, Knit 2 together "K 2 tog", K3*. Repeat from * to * to last stitch, Knit 1. You will have decreased by 33 stitches, and will now have 165 stitches. Row 3: K2, * K1, K2 tog. K6*. Repeat from * to * to last stitch, knit 1. You will have decreased by 18 stitches to 147 stitches, which is the same number of live stitches left at the bottom edge of the body. 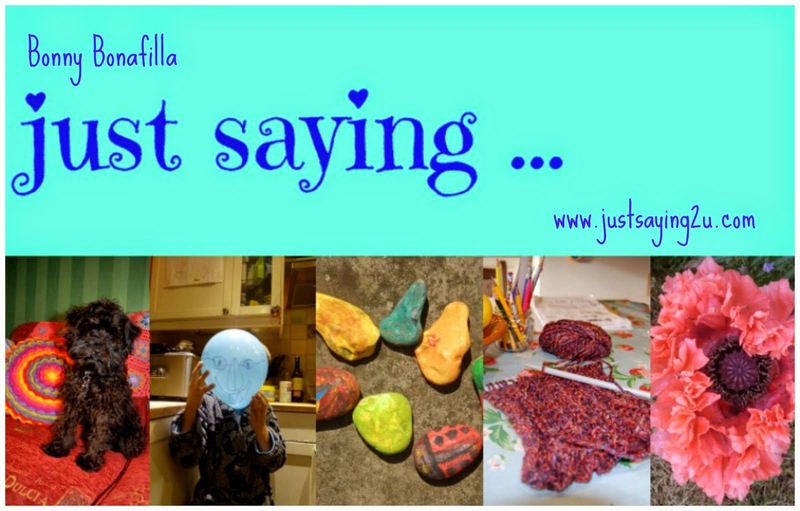 At this point it's a good idea to block the bottom frill. It will be easier to do if you block on a standard ironing board now than when it is joined to the body. I blocked my bottom frill with pins and a steam iron, leaving the fabric to dry out before pinning and steaming the next section. 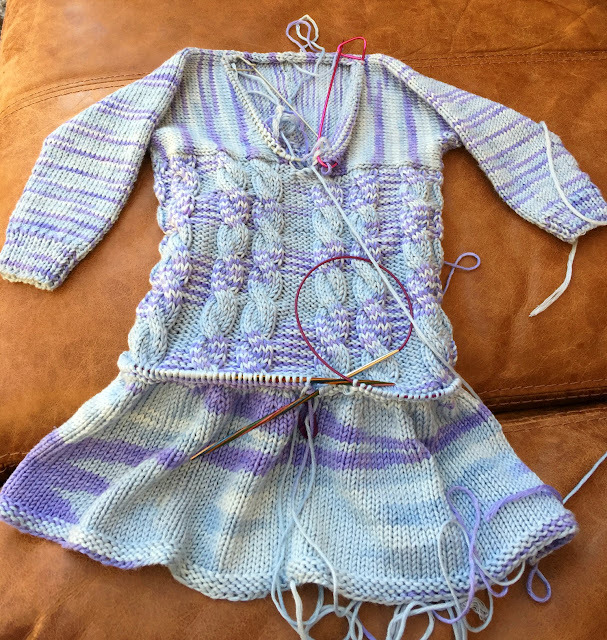 Now you're ready to join the body to the bottom frill of the skirt using a three-needle bind-off. Align the two sets of circular needles, matching the wrong side of one to the wrong side of the other, with the body needles on top. Then use the top right hand needle (of the body section) to knit a stitch from the top needle together with a stitch from the bottom needle all the way around. You will end up with 147 stitches and the 2 sections of the dress joined together at the dropped waist. You are now going to knit downwards to create the top frill, which flops over the bottom frill on the outside of the dress. Row 1: K2, * K1, Knit into Front and Back of next stitch "KFB", K6*. Repeat from * to * to last stitch, K1. By the end of this row you will have increased the number of stitches by 18 to 165 stitches. Row 3: *K1, KFB, K3*. Repeat from * to *. By the end of this row you will have increased by 33 stitches to 198 stitches. Carry on knitting until second frill measures 5 cm. Purl the next 3 rows, and cast off purl-wise. Now to shape the neck. Row 1: You will have 31 stitches on each of the front sides. You need to slip these stitches off the stitch holders onto a needle. Start with the bottom of the right side, right side facing, slip the 31 stitches along the right side neckline onto a 2.5 mm needle. Now pick up 18 stitches across the back of the neckline purlwise, and then purl the 29 of the 31 stitches of the left side neckline off the stitch holder and onto the needle. Purl the final 2 stitches together. You are now ready to knit the neckline in stocking stitch, working on the flat, using short row shaping. Row 2: knit to the last 2 stitches. K2 tog. Row 3: Purl to last 2 stitches. Wrap. Turn. Row 4: Knit to last 2 stitches. Wrap. Turn. Row 5: Purl to last 4 stitches. Wrap. Turn. Row 6: Knit to last 4 stitches. Wrap. Turn. Row 7: Purl to last 6 stitches. Wrap. Turn. Row 8: Knit to last 6 stitches. Wrap. Turn. Row 9: Purl to last 8 stitches. Wrap. Turn. Row 10: Knit to last 8 stitches. Wrap. Turn. Row 11: Purl to last 10 stitches. Wrap. Turn. Row 12: Knit to last 10 stitches. Wrap. Turn. Row 13: Purl to last 12 stitches. Wrap. Turn. Row 14: Knit to last 12 stitches. Wrap. Turn. Row 15: Purl to the end, working stitch wraps with the stitches wrapped. Row 16: Knit to the end, working stitch wraps with the stitches wrapped. Block collar, turn outside edge over and stitch in place along the back edging of the neckline. Darn in all the loose ends. Block the second frill and make a rose corsage to trim the neckline with. You can find my rose corsage pattern here. 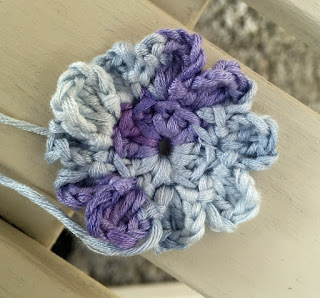 On this occasion I used only one row of petals, whereas the original pattern anticipated a second row behind the first. Then I cast off and sewed the rose in place with a button sewn on the centre. And that's it: you're done and your little princess is good to go. PS if you're in the Farnborough neighbourhood on 26th or 27th February do stop by and say "hello!". I'll be on the Costa Brava Knitting stand: S38.